Limited edition, numbered certificate of authenticity. Wood carved out of two years seasoned linden wood. Keepsake gift box with silk lining. Original Masterpiece Collection - Like legends, ballads and folk music, handcrafts constitutes an essential element of a nation's culture and nature is folk art's primary inspiration. Wood in many variations is by far one of the most popular material used for generations by folk art artists. 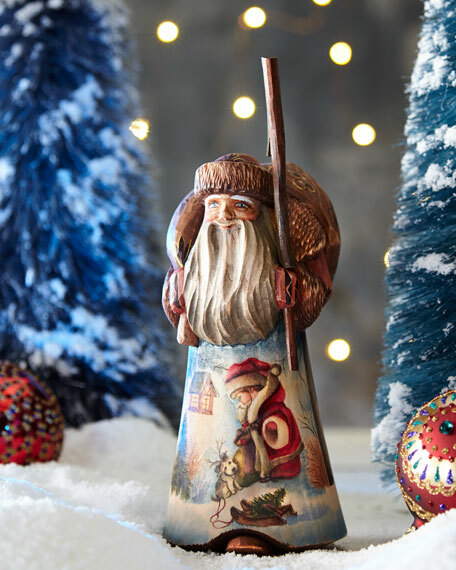 Preserving the artistic traditions and techniques of Eastern Europe, each hand-carved wooden sculpture of the G. DeBrekht collection is a unique and original creation. Every figure, ornament, and scene reflects the talents and collective skills of numerous artists, each trained for a distinct specialty in the meticulous and loving creation of a G. DeBrekht design that will be cherished today and for generations to come.